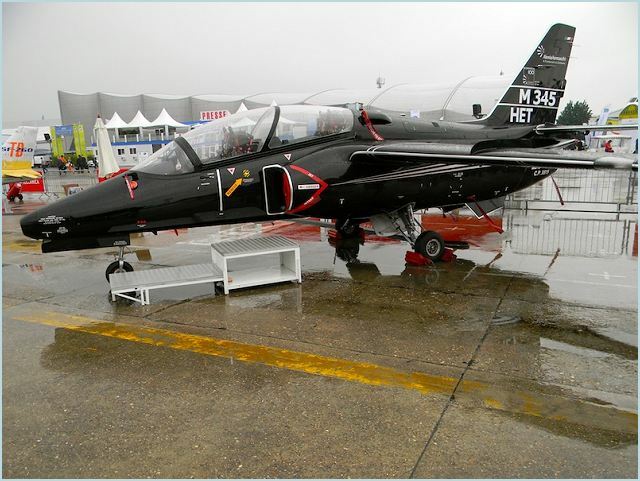 Alenia Aermacchi presents new basic-advanced trainer aircraft M-345 HET at Paris Air Show 2013. Alenia Aermacchi and the Secretariat General of Defence/National Armaments Directorate of the Italian Ministry of Defence have signed an agreement to jointly define the operational specifications and collaborate on the development of a new basic-advanced trainer, the M-345 HET (High Efficiency Trainer) and expected to enter service between 2017-2020. Alenia Aermacchi M-345 HET (High Efficiency Trainer) basic-advanced trainer at Paris Air Show 2013. The agreement, announced today at the Le Bourget Paris Air Show by the Secretary General of the Ministry of Defence, Gen. Claudio Debertolis and Alenia Aermacchi Chief Executive Officer, Giuseppe Giordo, calls for the immediate creation of a joint working team between the Defence and industry to define the technical specifications of this new aircraft and identify the steps necessary for the preliminary study and its consequent development, taking into account the principles of cost effectiveness and to satisfy the possible requirements of the global market. The new HET will be a further development of the M-345 jet trainer, the latest solution proposed by Alenia Aermacchi for the basic-advanced phase of military pilot training. The avionics system of the M-345 HET, through a significant containment of acquisition and operation costs, aims to offer a cheaper and more effective solution in the training of military pilots compared with the current advanced turboprop solutions which, although sharing the same weight class of the M-345 HET and similar on-board equipment, provide only limited performance and training effectiveness. The M-345 HET will be equipped with a turbofan engine in the 1.600 kg (3,500 lb) thrust class and will offer long endurance and high load factors between +7/-3,5 g. Furthermore, it will feature state-of-the-art avionics, including a HUD (Head Up Display) in the front cockpit and a repeater in the rear cockpit and multi-function digital displays for both pilot stations and HOTAS (Hands On Throttle-And-Stick) controls. The new trainer will be designed to guarantee a training syllabus perfectly aligned with that of the advanced and pre-operative M-346, starting from the elevated similarity between the two cockpits that will allow for the interoperability in joint training missions. With regards to logistics, operating costs will be reduced due to the fact that the M-345 will be designed with a two-level maintenance concept, eliminating the third and most onerous level of general revision of the aircraft. Easy access to the simple on-board systems and devices and a HUMS (Health and Usage Monitoring System) that provides all information on structure, engine and system for an effective monitoring of the condition of each single component/system, will simplify maintenance. The introduction of the pressure refueling system and of an OBOGS (On-Board Oxygen Generating System) will significantly reduce the quantity of personnel required for aircraft ground operations, thus reducing the interval time between flights and making the M-345 HET even more advantageous under the management profile.